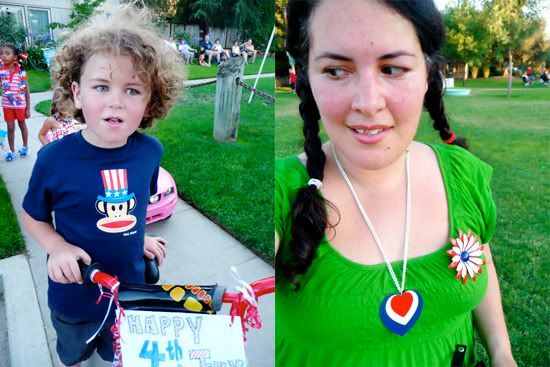 We forgot about the bike parade and had to do some quickie SUPER DOWN AND DIRTY homemade decorations for Wolfie’s bike. I feel like I should make a joke about my hubbie’s bangin’ booty. 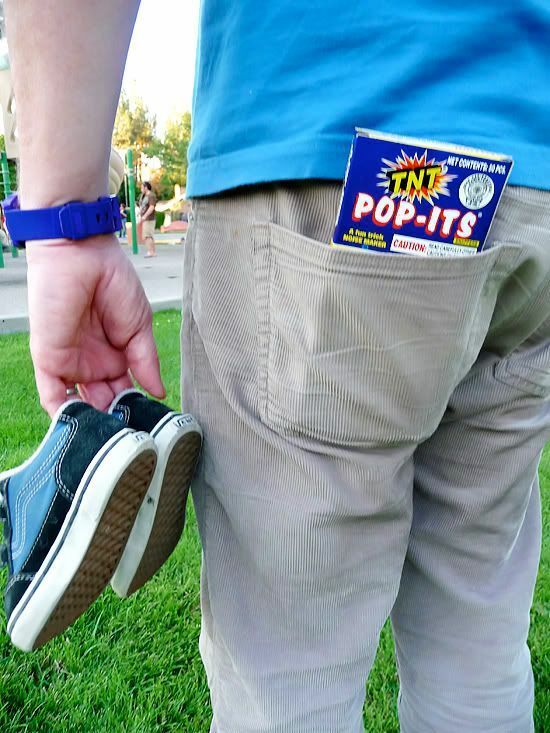 Pop pop pop! Oh my god it was over 100 degrees and I looked like a HOT MESS (literally) the entire day. This is a testament to how I luv ya—I’m showing you me in all my beet-faced glory. Hewww….of course Wolfie looks rosey cheeked and cute. Damn kids. 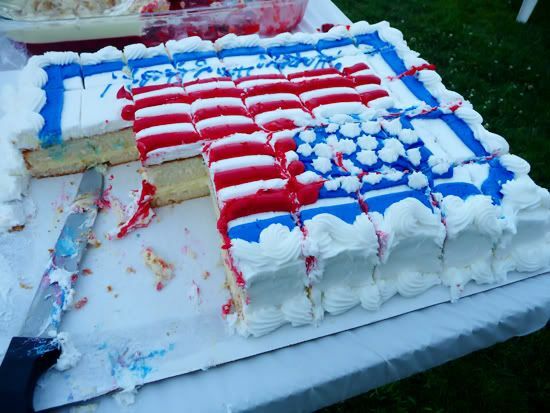 Of course there’s always a cakewalk. Greg and Lisa both won on their first try. 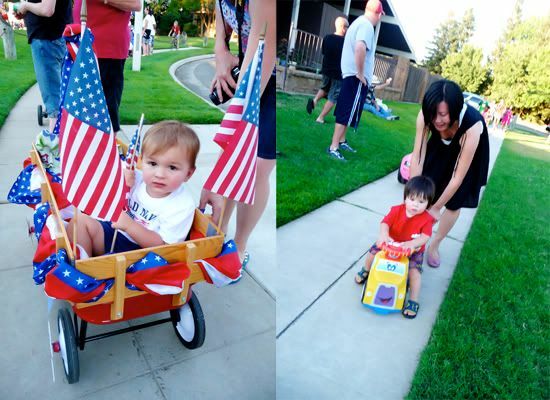 The liddle kiddle parade is my fave though….it’s super cute and the kids really get into it. Our friend Flo is down there on the right pushing her lil man Alastair. She made homemade ice cream sammies with home made peach ice cream and they were DEEEEEE-lishus!! Aw yeah! The pink Malibu Barbie car was back! Whooo hoo! This little girl is there every year. She almost ran me down, but she’s so fab I forgave her. Our neighborhood doesn’t really have sidewalks, so we’ve been slow on the bike riding dealie with Wolfie. He finally got a little cruiser with training wheels and he was totally into it! 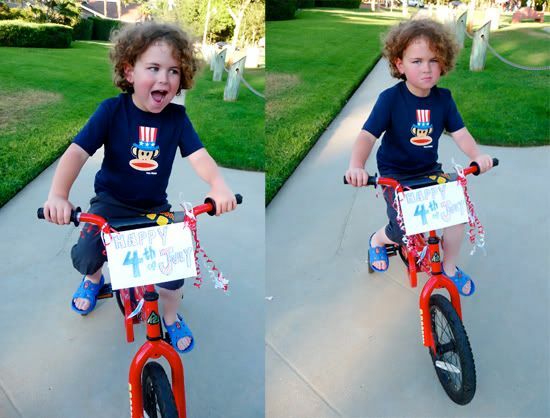 The training wheels have that wibble wobble thing where the bike suddenly leans to one side, making Wolfie shriek (in a manly way) and totally reminded me of being a kid….remember how the training wheels would bobble and you thought for SURE you were gonna wipe out? So that’s part of our weekend! I’ll spare you photos of us looking awesomely sweaty (but then jumping in the pool a zillion times to cool off). We came back to San Francisco and, as predicted, there was a chill in the air. Oh well, it was nice to get a lil taste of summer—even if it was just for a weekend. 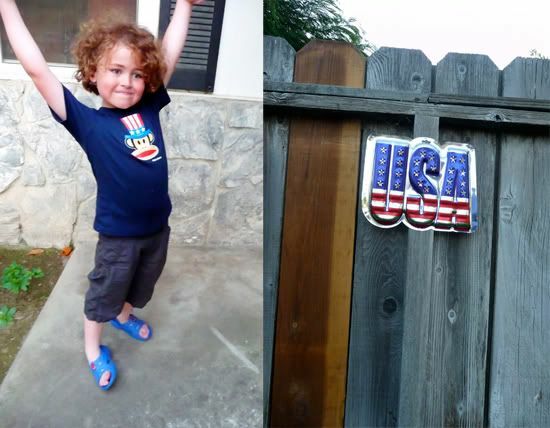 Tagged with 4th of july, 4th of July Party, Fresno, Modern Kiddo, parade. Wolfie you are just too cute! 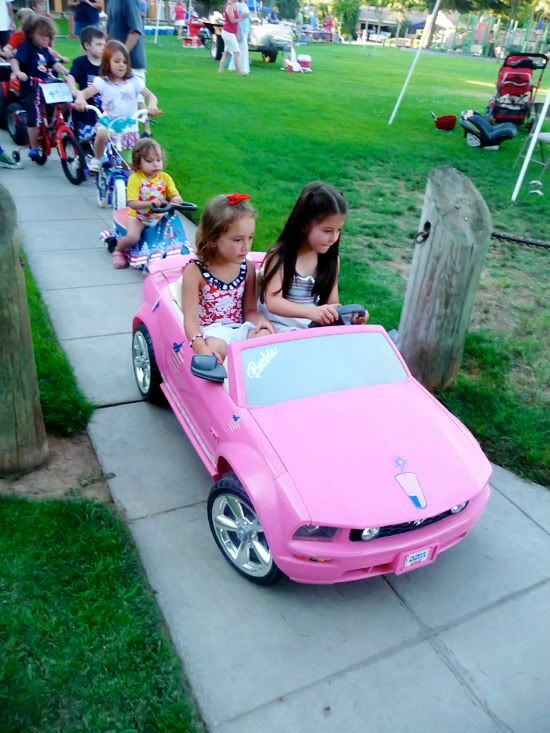 PS- I totally would have been those girls in the Barbie car for the parade! LOVE it! can i move in? seriously. 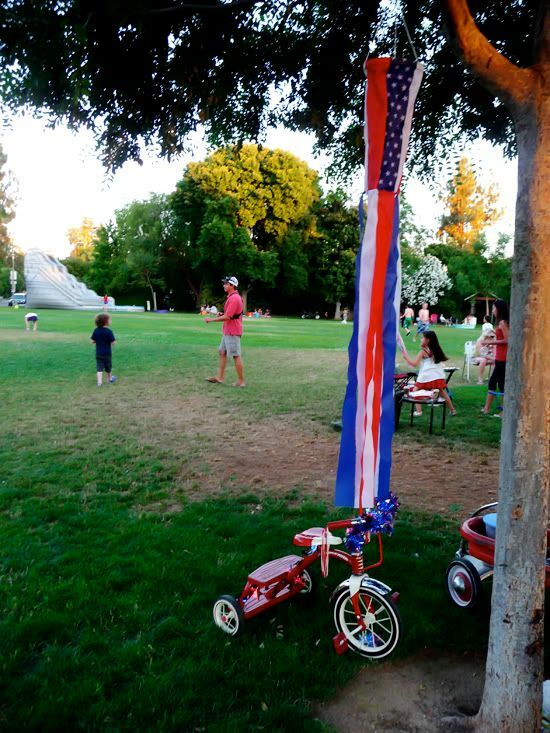 that looks like so much all-american fun. greg does have a banging body. lol! we went to my parent’s house on the prairie and the highlight for me was shopping with my mom with just the baby (no one begging for cheetos or cars) and going to the country kitchen and seeing a vampire. lynxymama.blogspot.com. you can see the vamp on my flickr. hee heee. oh and i did some thrifting of course! what a fun time! 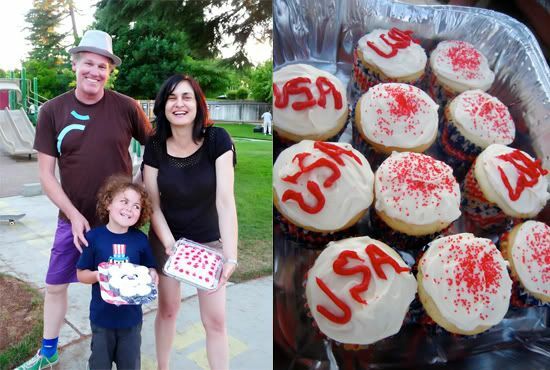 we spent our 4th swimming and eating cupcakes with 15 kids watching fireworks on the roof!!! and i heart your rosy cheeks! i put blush on to get that look!!! Okay. That’s it. I’m moving in with you! Looks like you had sooo much fun. We checked out the parade in our town and then hung with the grandparents. Fun, but this looked like a blast! 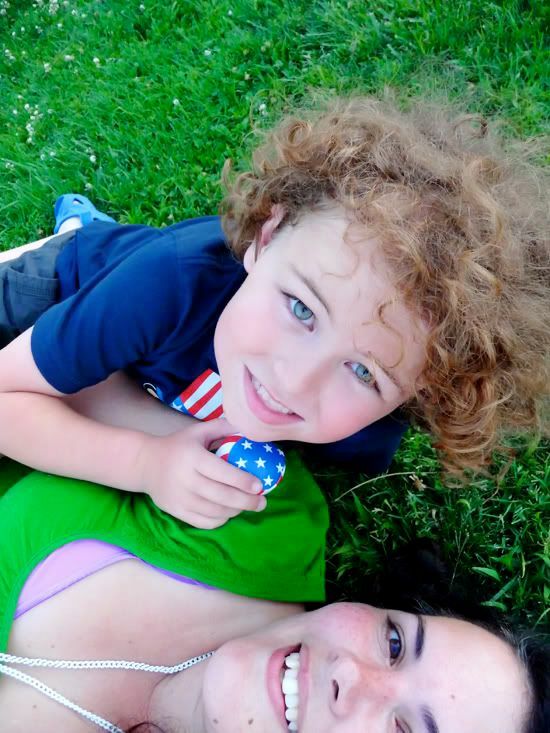 Wolfie and my little kiddo wore the same shirt! I think the Molo family needs to live in The Hills. Oh poopy. Did I mention that you all look so rad? You look rad and look like you had a ton of fun! Thanks Molo!! I’m sure Miss Gia was decked out in her finest too. Flo! Yay! Can I tell you how awesome it is to see your name over here?? I have a great photo of Alastair I have to send to you! (I almost posted it, but then I wanted that photo with in in the pic and I only had one….). We had a great time as always! And your ice cream sandwiches were SO GOOD. 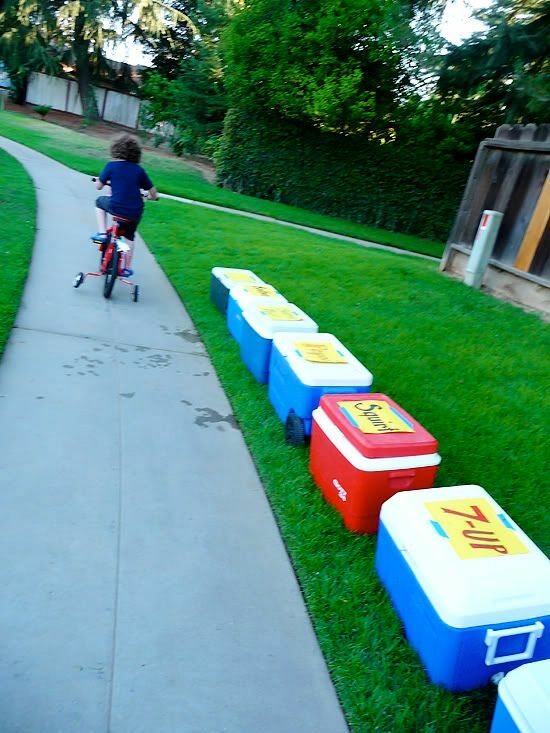 That picture with the training wheels–with the coolers saying SQUIRT and 7-UP? SO CUTE. Gimme a Fresca, stat! Marla: That barbie car kills me every year!!! it’s insane. I had a great pic of the girl doing a “queen’s wave” while driving. Lishy: Fresno has awesome thrifts too but we never made it over there!! Booo. Can’t wait to check out the vamp! Heather: Um….you didn’t just have cupcakes, i saw those r/w/b beauties on your Flickr!!! You should post a link here! Kodie: aw that sounds awesome. And great reminder—if you have something fun up in yer bloggie let us know for sure! Shari: Of course Wolfie and your kiddo wore the same shirt, we have FABULOUS taste! haha. We had the grandparents around too, last week, but they left on the 4th! Rocket Jody: That’s my fave too. It seems so old-timey to have an ENTIRE COOLER devoted to 7-Up or Squirt!!! 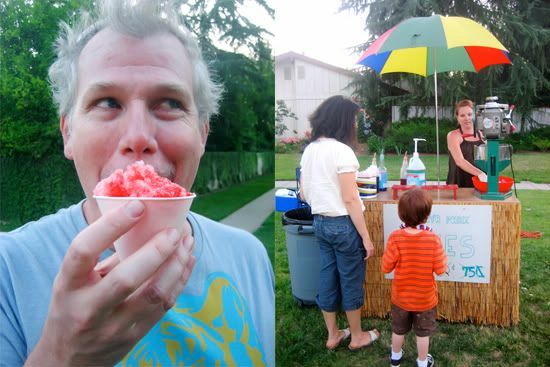 wow alix, you really know how to take fotos and make fresno sound fabulous (which it is)! i too got clipped in the heels by malibu barbie when i was pushing alastair, so i moved out of the way! anyway, it was great to see your family every year this way…and so happy we have a little tradition now!! What a fun time! Love the pics … and the bangin’ booty – LOL!